There is currently just the 1 ferry route running between Bimini Islands and United States operated by 1 ferry company – FRS Caribbean. The Bimini to Miami ferry crossing operates weekly with a scheduled sailing duration from about 2 hours. Whilst we’ve taken great care to ensure the information on this page is correct, as the frequency and duration of crossings on all routes can vary from time to time we’d advise that you get a live quote for current availability on this Bimini Islands United States crossing between Bimini and Miami. The Bimini Islands make up the closest Bahamian district to the United States, situated just fifty miles east of Miami, Florida. 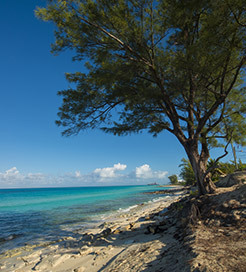 Comprising two main islands called North and South Bimini, alongside numerous cays, Bimini is one of the smallest archipelagos in the Bahamas. However, most visitors sail here to explore the beautiful depths of its surrounding ocean, teeming with tropical fish, dolphins and mantas. Together with brightly coloured coral reef, the seabed is decorated with enigmatic stone ruins, which most believe are the remnants of the mythical Lost City of Atlantis, while the shallow coastal waters in North Bimini feature a fascinating First World War shipwreck, SS Sapona. The Bimini Islands are frequently visited by tourists from the United States, which, in the past, included Ernest Hemingway and Martin Luther King Jr., so it’s easy to travel back to Florida by ferry, with a few sailings every week to Miami lasting just two hours.